Belonging to the string family, the violas and violins may sound similar to many. But the truth is that they are different and it is easy to distinguish between the two. One can differentiate between viola and violin in just one look. Coming to the size, the violin comes with a smaller frame than the viola. While the violins come with a standard length of 35.5 cm, the violas may come with lengths ranging from 38 to 48+ cm. There is also difference in the bow used. 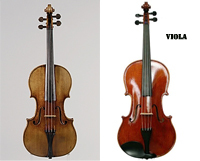 Though viola comes in a bigger size, the bows used in violas are shorter than used in the violins. It comes about a cm less than the violin bows. Viola bows also come thicker than the violins, which give it a somewhat “masculine” tone. Though viola bows come shorter, it is heavier than violin bows. While the viola bows comes in the range of 70 to 74 grams, the violin bows comes in the range of 58 to 61 grams. Well, more weight is needed to pull sounds from the viola strings than the violin strings. The violins are more pitched than the violas. While the violins are the highest pitched in the string instrument, violas are the second highest pitched instrument. While violins have a higher e-string, the violas have a low c-string. While the violin is tuned to G D A E, the viola is tuned to C G D A. Another difference that can be seen between them is about their role in orchestra. The orchestras generally have larger sections of violin than viola sections. While violins add to the melodic part, the violas add up to the harmony part. Let us see how one can differentiate the two string instruments by watching an orchestra. The players of viola and violin have different seating arrangements in an orchestra. The first violinists sit to the left of the conductor and beyond this the second violinists. And on the right sit the cellos. The violas sit in between the cellos and the second violin, just towards the centre of the stage. 1.The violin comes with a smaller frame than the viola. 3.The violins are more pitched than the violas. 4.While violins have a higher e-string, the violas have a low c-string. lanceaksh. "Difference Between Viola and Violin." DifferenceBetween.net. October 19, 2009 < http://www.differencebetween.net/object/difference-between-viola-and-violin/ >. The viola’s body is although thicker than the violin. Also, there is more distance between the notes on a viola than the notes on a violin.